Past the front gallery at Klein Sun Gallery where Geng Xue’s Borrowing an Easterly Wind contemplates spirituality and philosophy of tradition, humanity, and environment, Ying Zhu‘s Live Like an Astronaut is an imaginative and playful escapist experience that takes us to space, the final frontier. From the minimalist landscape drawings of Expatriate that suggest the Age of Discovery’s seafaring explorers’ first views of new lands to the semi-hidden cave wall hieroglyphs of Space Tears, Zhu turns us into explorers. The transformation of gallery space into extraterrestrial space owes to her interest in small objects and units and talent in creating wholes that are other than the sum of their parts. 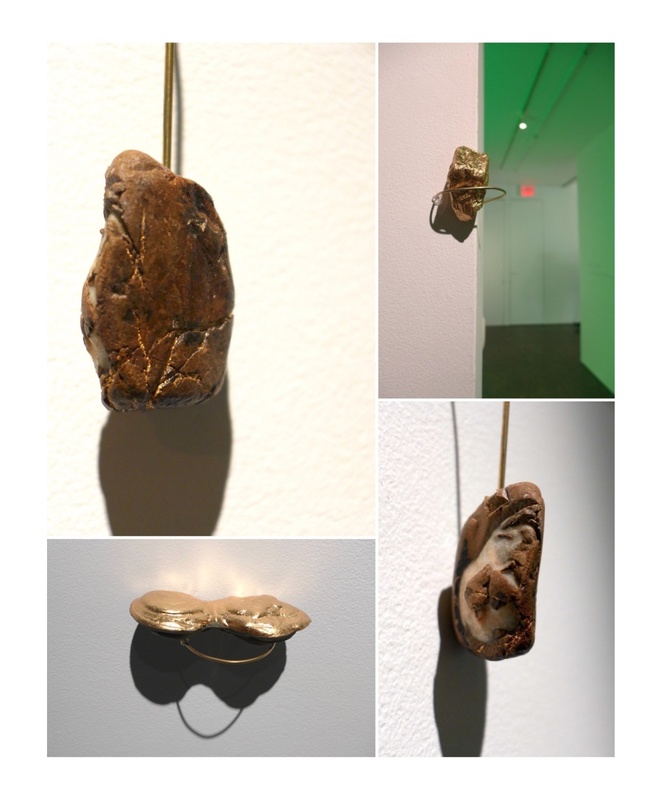 As we float through the dimmed space with small circular mirrors embedded in the walls that twinkle like stars as they catch exhibition lighting, we are drawn to a variety of objets d’art placed at different heights that resemble rocks and minerals and whose shapes, angularities, and granularities invite up-close examination. When we see the foam tessellation on the ground, we are eager to suit up with blue booties and set foot on the alien terrestrial surface. Space is infinite, but further exploration is barred by gate that prevents access to Klein Sun’s non-public areas. “Souvenirs” in bright green neon humorously twists this abrupt end by envisioning our space experience as astro-tourism. 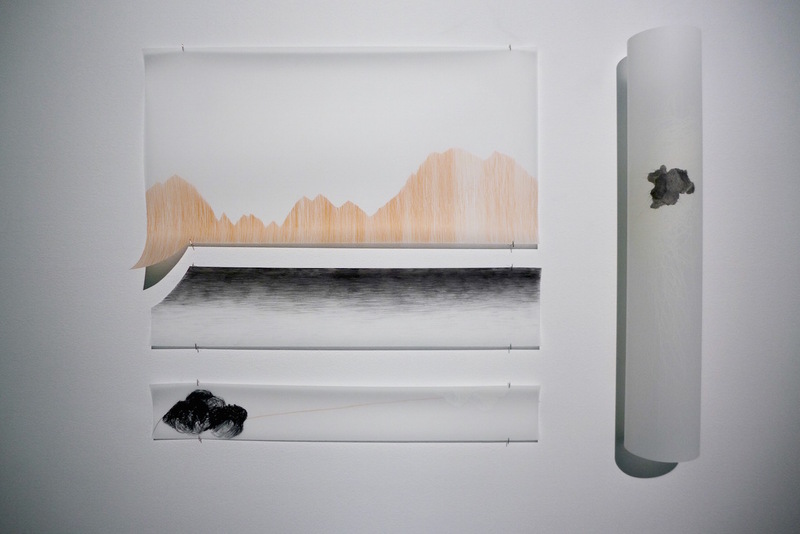 While these created experiences are imagined (Zhu has not yet been to outer space), they draw from personal interests and her mindset as someone who considers herself “neither completely Chinese nor an American, but a little bit of both at the same time.” Zhu, who developed Live Like an Astronaut at the Klein Sun Residency at Millers Falls Art Bridge, took time to elaborate on the exhibition and her background. With all the different media and images, Live Like an Astronaut feels like an exploration and discovery of new things. What do you imagine it to be like to live like an astronaut? Did you ever want to be an astronaut? 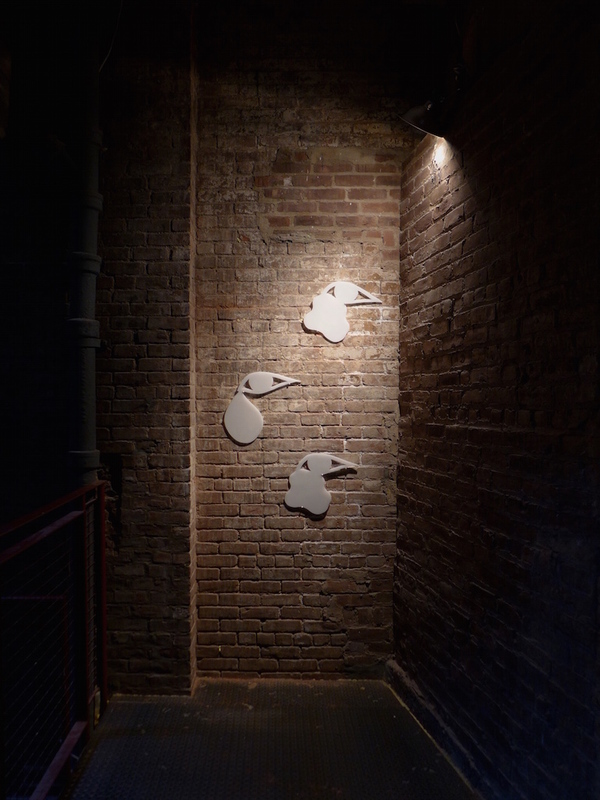 This installation is indeed an exploration of new things, both conceptually and formally. I had a vague idea of how this installation is going to be, but things really unfolded and evolved on site. To me, living like an astronaut is more of a metaphor, it is about discovering the unfamiliar and adapting. I’m interested in how one behaves while the understood perceptions are challenged. I imagine living like an astronaut would be wild, inspiring, and with some frustration mixed in. When gravity stops working, our fundamental understanding of the world and ourselves change. What expected to be true may no longer exists as truth, so it is an opportunity to look at things anew and reexamine. It’s a fresh start. I don’t think I would qualify to be an astronaut, but I would love to go to space as a “tourist”. What was your experience as an artist living and working in rural Massachusetts for the residency? Does it contrast with your regular life and work setting in Nebraska or China? How did your time at the residency influence or inform this exhibition? Everything slowed down for a bit, it felt like an insulated space. I was not very concerned with the outside world. It is more of inward looking experience. Although quiet, but everyday felt very lively because everyone lived in a big house, and there were two young energetic boys (sons of the residency director) who brought great energy. It is like living in a big family, quite different from my daily simple family life in Nebraska. The church and the nature surroundings at the residency had a strong presence, as if time slowed down, and I had a chance to look with more care. It definitely influenced my approach to manipulating the objects that I was working on. I see an intricacy in detail and structure to your works that puts a twist on the structured, yet organic, design of nature. It’s a seemingly scientific appreciation of the natural world. Are you a scientific person? I am not a scientific person, but I am extremely fascinated by science. I’m always interested in finding out how things work, I work hard to break rules but constantly constructing structure at the same time. The contradictive nature in me that inevitably come through my work. 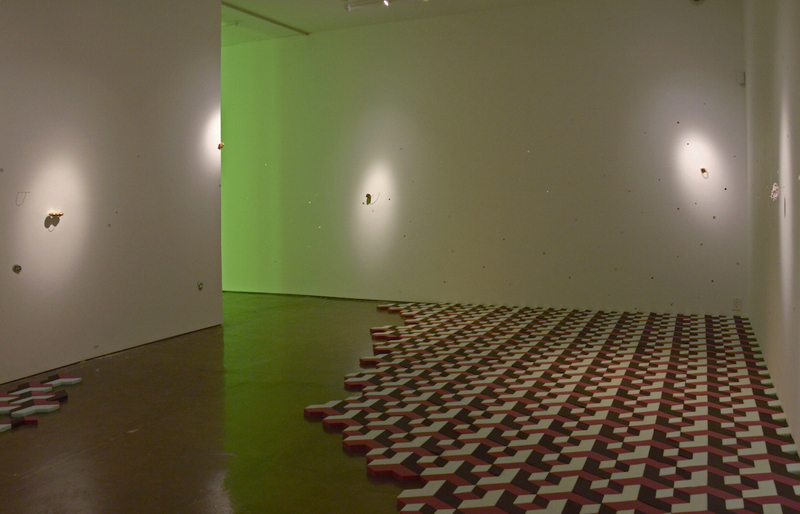 In this exhibition and other works, you utilize small fragments and units. When they’re on their own they seem outsized, and other times, you use them as parts to form something larger. Tell us about your interest in these small pieces. I’m always drawn to repetition and small little things. Growing up in China, I was taught that individuality should always be compromised for greater collective good. In a sense, I’m trying to prove that all small fragments together do make a grander gesture, but simultaneously, I also try to demonstrate that each fragments is its own unique unit, no two are the same. I hope to bring a spotlight onto small details that normally get over looked. In addition to the visual experience, there’s a tactile experience, which is relatively rare in art. Why make it a part of your work? After all, I want to have a little fun, to be playful. Photo collage of four Untitled, 2015. Mixed media. Is Expatriate connected to your own relocation to the United States? The title’s perspective contrasts with “immigrant”. Why did you choose more of an outsider’s viewpoint? I understood expatriate as someone who lives outside ones’ country, I thought it was rather fitting in my situation. Having moved to the states in my early adulthood, which are opinion-forming period of my life, I become familiar with western style life. The fact that I am Chinese will never change even I think like an American most of the time. I consider myself neither completely Chinese nor an American, but a little bit of both at the same time. So technically, I am an expatriate in both countries. Therefore, I am an outsider, and my viewpoint towards both places has some aspects of the insider and outsider. The exhibition description says that you examine western culture through “distinctly eastern eyes”. What perspective does your Chinese background bring to your art and your life in the US? Has it changed the longer you’ve been in the US? The most profound aspect of my “easterness” would probably be my eastern aesthetics. I prefer a quiet aesthetic with intricate details that requires a good deal of consideration but not screaming for attention. Growing up in China, there were a lot imposed rules and expected behaviors. I spent most of my childhood trying to break or twist rules so I don’t have to behave properly. Fortunately and unfortunately, I didn’t completely grew out of that mentality, and it is carried through into my art making. My approaches are often testing limits, seeing what I could get away…but I also set perimeters and structures. It’s a tricky balance to maintain, and it is forever changing and evolving. Tell us about Space Tears. Why are we crying in space? Why don’t we cry in space? It can be happy tears. I saw a video of astronauts demonstrating what happens when you cry in space, and I was absolutely mesmerized. Tears don’t fall because there is zero gravity. And it balls up due to the surface tension. So tears actually get materialized, become something tangible and float around, you can reach out and catch it. How cool is that! As if our emotions can be seen and touched. It also ties with the idea that what we understood as truth may change given a new environment. Live Like an Astronaut and Borrowing and Easterly Wind are on view at Klein Sun Gallery through September 5.